I’ve been watching with excitement ever since the announcement of powershell going open source and coming to multiple platforms like Mac and Linux. My early experiments with it weren’t too productive – Powershell, with a base set of about 300 commandlets worked, but all the add-in commandlets I needed to work with Azure did not. Jessica Dean wrote an article and another about how to install the azurerm.netcore.preview modules with an earlier beta release of powershell for the mac. Unfortunately, I could not get it to work – I suspect it required a specific alpha or beta version of powershell for mac, as I remember being a version ahead at the time it didn’t work. Powershell Mac Beta 4 has been available for a few weeks. UPDATE: PowerShell Mac Beta 5 was released on August 2nd 2017. I’ve tested the steps in the article and they still work with Beta 5. In the past I’ve installed the beta without issue, and I’m assuming if you just double click the installer, you’ll be fine. I always start powershell by opening terminal (a built in mac app) and then typing powershell. At this point if you type $(get-command).count it’ll return about 300 commandlets. 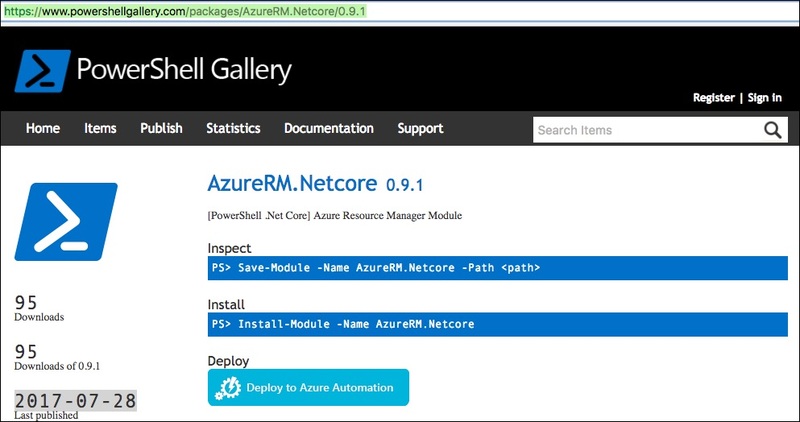 To install the Azure RM extensions, I did a search on the powershell gallery site: https://www.powershellgallery.com looking for azurerm.netcore. I followed the instructions under install and got an error about not having permissions. After that. I did a get-command and I now have nearly 900 commandlets! Next I typed add-azurermaccount and I was able to get in! Now, with proof that things are working, I wanted to confirm it worked without starting powershell with the sudo command. Sure enough it works fine without it. In closing, I’ve outlined the steps needed to install powershell and the azureRM extensions on a mac so you can work with azureRM powershell commands on your mac. Let me know in the comments if this helps!